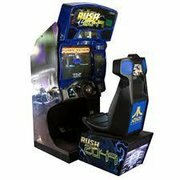 Description: Quite possibly the best driving simulator ever, RUSH features spectacular graphics and audio. Futuristic sports cars race through stunt filled tracks. The new luxury cabinet with 27" VGA monitor also features a deluxe attraction marquee, 360 degree sensory audio with 5-channel, 5-speaker surround sound for both music and sound effects. A must for your next event.